Alexander Hardt works as a sound designer, produces radio plays and radio broadcasts. Roman Weingardt works as a sound designer, produces radio programs and develops audio software. 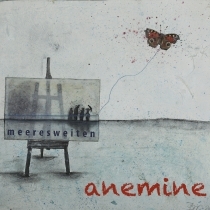 The album “MeeresWeiten” is their first release for “Lemongrassmusic”. During a long-standing collaboration, Anemine has developed its very own sound aesthetic. Most of the sounds, the two guys are using, arise out of their own made samples, self-developed software and field recordings. Elements of improvisation and collage pour equally into the process of sound composing.